There are a few cards in Modern that everyone absolutely loves unconditionally. Particularly the ones that don’t allow them to cast their spells. You know, we have Blood Moon, Stone Rain, and Choke as some common fan favorites! Spreading Seas for the less devout, and Sea’s Claim for the more dedicated. Ghost Quarter and Field of Ruin for those who don’t like using up spell slots for such nonsense. But what about another approach? What if we don’t care about whether or not the opponent can cast their spells, so much as whether they resolve? No, calm down control players, I don’t mean like that—and before someone speaks up about Isochron Scepter, forget it. We’re talking Chalice of the Void. The infamous little artifact that could. As card pools get wider for older and older formats, those formats become more and more about brutal efficiency. As a result of this, the average converted mana cost in a particular deck goes down in turn. 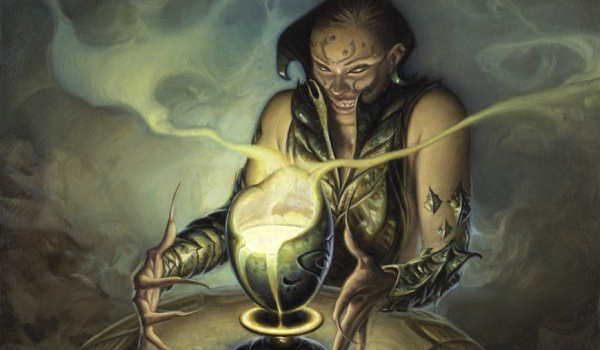 Modern follows this trend, too, which is a big part of the success behind decks like Grixis Death’s Shadow. They are so efficient at double-spelling it is difficult for them to fall behind. Both their answers and their threats often cost them one mana, so they can usually stay in the game no matter what is being thrown at them. Enter Chalice of the Void. Grixis can still be pretty good at casting multiple spells a turn, but suddenly not so good at resolving them. Most of their deck turns off with a Chalice on one in play, and while they do have some answers to a resolved Chalice, they have been cutting on their number of Kolaghan’s Commands lately. Many other decks in the format don’t have any answers to a resolved Chalice at all, at least in game one. Pair this with the taxing effects of Thalia, Guardian of Thraben, or Leonin Arbiter stapled to a Ghost Quarter, and it can become difficult for the opponent to resolve any spells at all. Being light on mana while facing down a Chalice on one and a spell-taxing effect is not a good recipe for executing a game plan. At this point you can throw down a Thought-Knot Seer both to end the game quicker and steal an opponent’s out for when they eventually will have enough mana to actually cast something. Perhaps you just bash with a Reality Smasher to put your opponent out of their misery sooner. The biggest reason this deck is exciting to me is its commitment to accelerating out taxing effects. Three copies of Gemstone Caverns and four copies of Simian Spirit Guide can lead to some incredibly early lock pieces. Sure, we all understand how backbreaking turn-one Chalice can be, but what about turn-one Thalia? Turn-one Leonin Arbiter? In specific situations these plays can be just as powerful at locking an opponent out. If you play a turn-one Arbiter on the play, it is entirely possible your opponent will not have access to any mana for the remainder of the game, depending on their number of fetchlands. Another content creator, going by the username of SpiderSpace, has been playing this deck for a while and fine-tuning it. He has found some additional online success with it recently, hitting the usual 5-0s in leagues, but also 7-0 in a recent Modern Challenge and 7-2 in the PTQ Finals. If you are interested in checking out more about the deck I highly recommend taking a peak at his Twitch channel for more content regarding the list. I hope you enjoy the matches and as usual, I’m interested to hear what kind of content you’d like to see moving forward, so I can continue to evolve and improve my videos. Let me know what you would like to see! If you want similar content, check out my Twitch channel for some more live Modern. I love decks like this that exploit conceits in the metagame at large. The point you made about the turn 1 arbiter is spot on. Think about it, how many hands have you kept on the draw in modern where your only couple lands in hand were fetches? Brutal stuff right there. I think thorn of amethyst or maybe vryn wingmare might have a place in this deck. Having potential thalia 5-8 can be backbreaking for many decks in modern. given that thorn or wingmare would probably be best in the sideboard since there are decks like humans, affinity, and other creature decks which just don’t care about this type of effect.